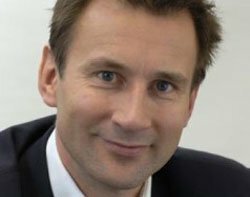 Health secretary Jeremy Hunt has promised all NHS patients in England will have online access to their medical records by April 2015. Speaking at the Conservative Party conference in Birmingham, Hunt claimed England will be the first country in the world to offer such access to patient data. “It means you will no longer have to pay to access your medical record. You’ll be able to see it and show it to anyone you choose. You’ll find it easier to do detailed research about your condition and easier to challenge decisions. Because the boss is not the doctor – it’s you,” he said. Delivering online records would meet a commitment first made by Hunt in 2012 to make medical data available to GP patients by 2015. GPs have agreed to the move as part of the new GP contract agreed between the British Medical Association (BMA) and NHS England. GPs will also expand the availability of online appointment bookings. “In 2015/16, practices will also be required to offer online access to all detailed information – for example, information that is held in a coded form in the patient's medical record. GP software will be configured to offer all coded data by default, but GPs will have the option and configuration tools to withhold coded information where they judge it to be in the patient's interests or where there is reference to a third party,” said a briefing on the BMA website. In April this year, NHS England provided an extra £230m of funding to help improve the IT systems used by GP practices. Hunt also said NHS England will release more information about its performance as open data through the MyNHS website. “This summer we became the first country in the world to publish detailed information about safety, waiting times, patient experience and food for every major hospital. And on the new MyNHS website we’ll go further,” he said. The website already offers downloadable data on hospitals, social care and public health services. In January 2013, Hunt said he wanted a paperless NHS by 2018. He said all patients should have compatible digital records so their health information can follow them around the health and social care system. Currently, there is very little integration between health data – held by the NHS – and social care data, which is held by local authorities. Hunt told the Tory conference progress is being made on integrating health and social care systems. “For the first time ever, it is happening – 150 local authority areas working together with their local NHS on their Better Care plans to pool commissioning, reduce emergency admissions and share medical records, all starting from next April,” he said. The NHS is now different organisations in different parts of the UK, so Hunt’s announcements only apply to NHS England, not to Scotland, Wales or Northern Ireland, which are following their own plans. The NHS has had a chequered history in its attempts to provide online medical records. The failed £12bn NHS National Programme for IT spent billions of pounds trying to establish electronic patient records in every GP practice and NHS trust, before it was scrapped in 2009.